A long time ago in a galaxy far away, Star Wars was born. Luckily for us here in Indianapolis, there are lots of local Star Wars adventures right nearby with no spaceship required! Whether you and your kids are long-time fans of characters such as Han Solo, C3PO, R2D2, Luke Skywalker, or partial to Yoda, like I am, there are plenty of opportunities to practice using the force in celebration of the newest Star Wars movie, Rogue One. May 4th is Star Wars Night for the Indianapolis Indians as they take on the Gwinnett Stripers at 7:15pm. On Star Wars Night, Victory Field turns into a galaxy far, far away. Darth Vader, Jedi and Stormtroopers will be there for photo opportunities. The Hot Corner Gift Shop will have Star Wars Night merchandise available for sale. Plus, enjoy music from the movies during the game and stick around afterwards for a Star Wars-themed postgame fireworks display. Behind the Scenes: A Star Wars Writer Reveals the Stories Behind His Best-Selling Books. Dr. Reynolds will tell the story of how his creative obsession with his favorite movie turned into a dream career as a best-selling Star Wars author. Free tickets are required and will be available starting Friday, April 27, on a first-come, first-served basis at the Children’s Desk. This event is for ages six and up and takes place on Saturday, May 5, 11am-12pm. On May 5, 1pm-3pm, Join in Star Wars activities: make your own lightsaber and challenge your Jedi skills, come dressed up as your favorite character and get your picture taken at our out-of-this-world photo spot. Families with children of all ages welcome. Drop in to the Storytime and Program Rooms anytime between 1:00-3:00 p.m.
Star Wars Day in Fishers at the Fishers Library is an annual event that no on wants to miss! Star Wars Story Time: Let the Star Wars festivities begin with intergalactic Story Time! All ages and their families are welcome to attend. Stories begin at 10:00 followed by a simple craft. The Yavin 4 Star Wars Tribute Band is made up of four veterans of the Indianapolis music scene, bringing together members of The Enders, Lockstep, Devil To Pay, and The Hardees. The diversity of influences comes across in the music, but is brought together into a cohesive sound about one thing, and one thing only: STAR WARS. Tune in 11:30am-12:30pm. The Music Awakens – Join the ISO’s Learning Community at Fishers Public Library as they explore the role of music in the Star Wars films. Musicians from the ISO’s Metropolitan Youth Orchestra will perform the familiar themes, and their team will host an interactive experience that is sure to leave you humming along at the end! Check it out 2pm – 3pm. Visit Indy’s only lightsaber combat class at Indy Lightsaber Academy. Classes are held weekly at the YMCA and there’s a special competition on May 5th. Learn how to safely use your lightsaber as you learn the basics of stage combat and sword techniques. Bring your own lightsaber or borrow a practice one. The first class is only $5 and is suitable for kids 12 and up and adults. Go ahead and save the date! IndyPopCon will be held July 8-10, 2018 at the Indiana Convention Center. PopCon celebrates many aspects of pop culture, including comics, movies, art and music, and gaming. Star Wars is always a staple at this adult and kid friendly weekend! What else is happening in our saga of Stormtroopers, spacecraft, and sci-fi? Much like the galaxy, this list will be ever expanding, so feel free to let us know what other Star Wars events are occurring near you! 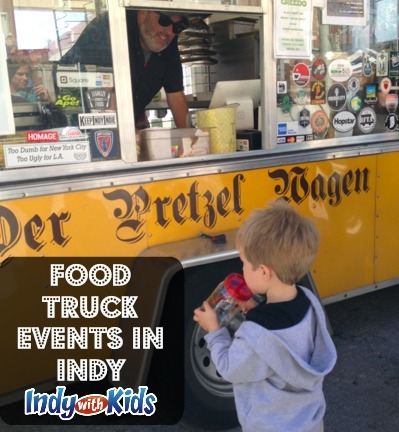 Find even more events on our family friendly Indianapolis events calendar.